Automotive Safety Engineering's (ASE) ergonomically designed Laptop Stands for Vehicles are designed, developed and manufactured in Australia using high-grade materials. 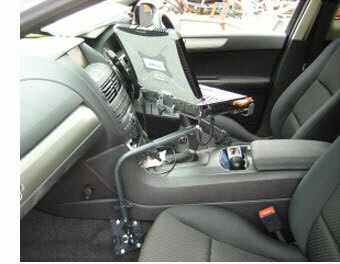 With the use of laptop computers in vehicles becoming more prevalent in today's society, our Laptop Stands for Vehicles are tailored for use in the mobile office environment. The two Cam locking mechanisms prevent theft of the laptop, with one lock preventing the laptop being removed from the stand, and the other lock preventing the entire stand (including laptop) being removed from the vehicle. 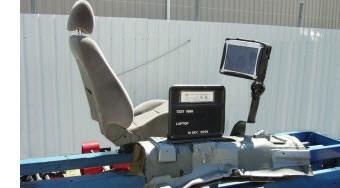 In addition to ease of use, safety is an important consideration when using a laptop computer in a vehicle. To prevent the laptop becoming a hazardous flying object within the vehicle during a collision or an emergency evasive manoeuvre, our stands have been designed and tested to the crashworthiness of Australian Design Rules ADR69 Frontal Impact, and ADR72 Dynamic Side Impact. As at March 2010, ASE's Laptop Stands for Vehicles are the only vehicle laptop stands sold in the Australian market that meet these associated Australian Design Rules (ADR) and Australian Standards (AS). For further information about ASE's Laptop Stands for Vehicles, please contact ASE.